I’m sure there are some select strategies that are holding up during this downturn, but from a traditional perspective, bonds are really the only assets treading water. This list includes all of the double digit losses I outlined a few days ago on the S&P 500 since 1980, along with the current correction. 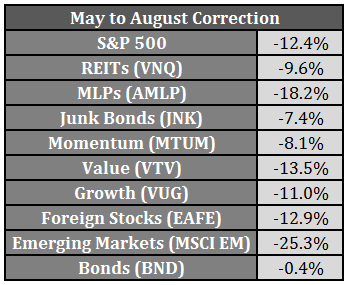 None of these other markets have been positive when the S&P 500 hits correction or bear market territory in the past. While some like to use these types of numbers to expose an Achilles heel of diversification, I don’t think that’s the case here. What this shows is that during market sell-offs and panics investors tend to shun all risk assets, regardless of company size or geography. These are the times when high-quality bonds or even short-term cash equivalents finally have their day and prove their worth for inclusion in a broadly diversified portfolio. They provide not only an emotional hedge but also act as the flight to safety asset class during a market panic. The last couple of days have unnerved and surprised a lot of investors. The wild intraday swings feel like they don’t have any place in the largest, most liquid financial markets. But this type of volatility is nothing new. In early August of 2011, the last correction we’ve seen in U.S. stocks, the market had four consecutive days with returns of -6.7%, +5.2%, -4.8% and then +4.6%. That was a little less than two months before that correction ended, so the volatility was a precursor of what was to come, not an end to the sell-off. Volatility tends to beget more volatility in the markets (in both directions) as investors start to make rushed and panicked decisions. After a number of years of relative calm, it appears risk assets are finally living up to their name. Consumer loans (p2p) fared perfectly @ 6% avg. Default rates are pegged to unemployment, which is quite low these days. This is true. It’s quite possible the economy will be outperforming the markets to play some catch up in the coming years. There should be a consumer lending ’40 Act fund launching in the next 12 months, which should help to include it in more of these asset class roundups. Do you think this will be the first time in history we will see a bear market without a recession? Over the past 21 business days since July 28th, Consumer Staples (symbol XLP) has outperformed the S&P 500 (symbol SPY) by 1.73%, confirming its reputation as a defensive sector. Equal-weighted Consumer Staples (symbol RHS) outperformed SPY by 3.71% over the same period. In a substantial downturn, all sectors decline. But some decline less than others. For instance, the sector with worst momentum, Energy (symbol XLE), underperformed SPY by 5.41% since July 28th. I put a tiger in my tank … but it drowned. Also interesting that the best two sectors YTD are still consumer discretionary and healthcare. Both have been outperforming for some time. XLE down almost 40% over the past year.